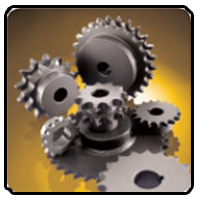 All SKF sprockets are manufactured to DIN 8187/DIN 8188, ISO 606 and ASME B29.1M standards. These products are made from steel material C-45 and Fe-4 0. The teeth can be hardened if requested (only steel C-45 can be hardened). SKF can also provide surface treatment upon request, such as black oxide and zinc plating. Tolerances are machined according to DIN 8196. All sprockets are completely deburred and protected with rustproof oil.